Last night, prior to our Northern Lights outing, Chuck taught us about Arctic ecology. We learned about some of the factors contributing to climate change and why the Arctic region is so vulnerable. The opening up of the Northwest Passage and increased offshore drilling put this area at further risk. Chuck encouraged us to learn more about Russia’s direct involvement in this area as well as becoming more informed about Alaska’s offshore drilling and hunting policies. Chuck mentioned that one massive oil spill in the Arctic would be enough to destroy the region. He also stated that if policies remain consistent and without better regulation, the entire population of Polar Bears in Alaska could be extinct within 5 years. I wanted to get a sense of the number of bears in the Churchill region and to get a better understanding of the threat to the Churchill bear population. Are the Churchill polar bears in as grave danger as those in Alaska? 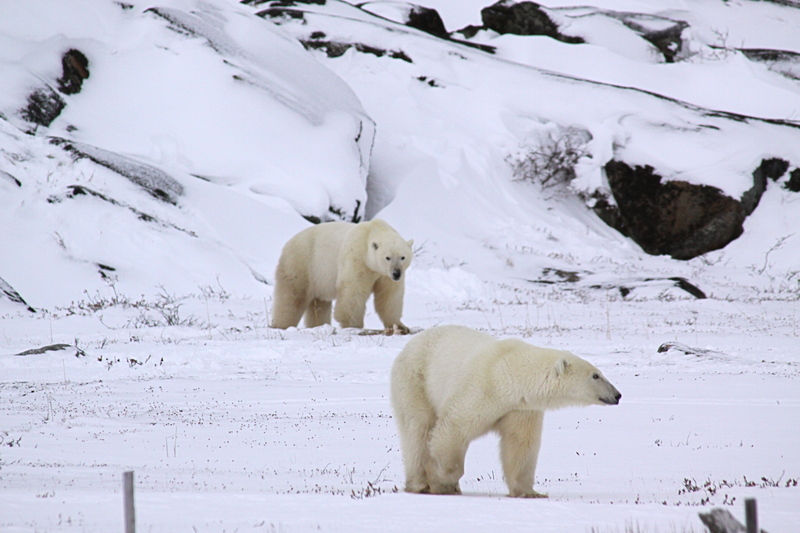 I asked several biologists in Churchill as well as a representative from Polar Bears International about the current population of polar bears in the region. Estimates ranged from 600 to 900 polar bears depending on the source. 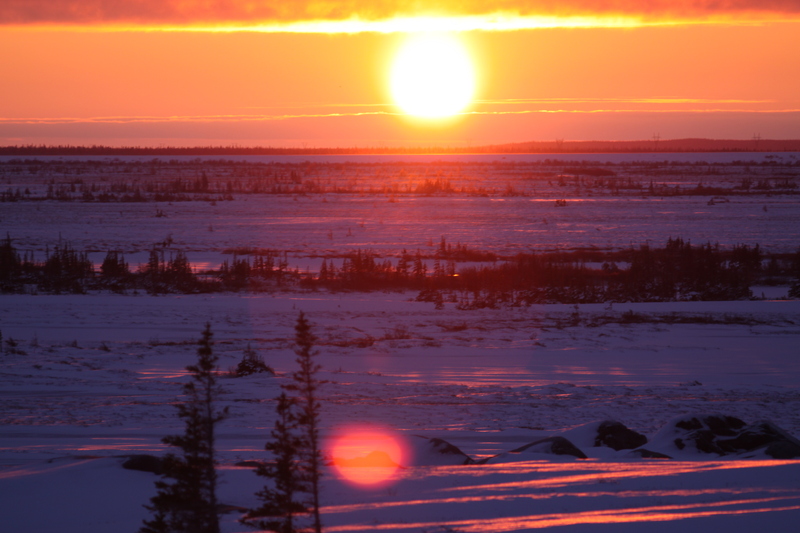 The Hudson Bay extends further South than other Arctic regions and is also where the ice freezes first, so bears migrate here from both the North and the South to get out on the ice and hunt seals. This migration and the decrease in funded research makes it difficult to know for sure how many bears are “residents” of Churchill versus those passing through to hunt seals when the ice freezes. While it’s difficult to get an exact count of the polar bear population in Churchill, everybody seemed to agree that it’s fewer than 1,000 bears. Having spent the past 2 days (and several days last year) gazing into the eyes of polar bears it saddened me greatly to have an even better understanding of their potential demise. Having an awareness of the climate change issues facing the Arctic region is different from experiencing its impact first-hand. There are things we can do individually to help decrease our contribution to climate change: utilizing high efficiency appliances, light bulbs and low-flow or dual flush toilets; walking or cycling when possible instead of driving; ensuring car tires are properly inflated for maximum fuel efficiency; offsetting our carbon footprint by contributing to clean energy alternatives, etc. Stop Global Warming lists several simple actions we can take as individuals to minimize our personal impact. Climate change is also a global issue – there’s a need for tighter regulations of offshore drilling, it would behoove North America to take a more vested interest in Russia and their perceived “ownership” of Arctic waters. We can pressure our government representatives about these issues, those of us that are eligible can run for political office, we can help educate people about these issues (as Chuck continues to educate those of us in his Arctic Ecology Field Course). With the reminder of threats facing the polar bears and Arctic ecology fresh in mind, we set out for another day of bear watching. We tracked one bear that seemed to be on a mission, with a very clear path. He moved swiftly over the snow and rocks, pausing every few minutes to sniff the air before taking his next step. 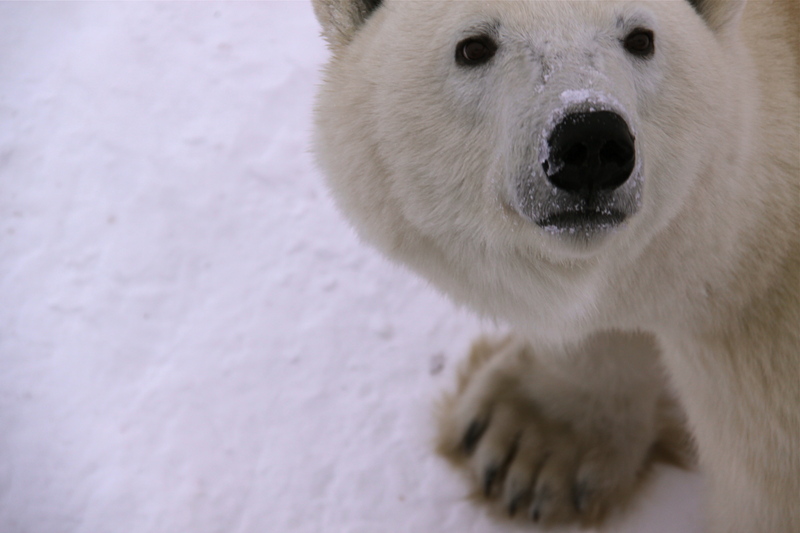 The sense of smell is a polar bear’s strongest sense – it’s how they locate a suitable food source, typically seals. It’s estimated that polar bears sense of smell can range several miles, including underground and through the thick Arctic ice. The large bear made its way toward another bear that was sleeping at the base of rocky hill. We thought perhaps there could be an interaction between the bears – maybe some sparring. Instead, the bear found a large leg bone of an unidentifiable animal. Based on the length and structure of the leg bone Chuck guessed it could have come from a caribou. The bone was out of place and it’s speculated that it was bait placed by tour operators or photographers to lure the bears closer to areas accessible for public viewing. One of the most disturbing things I noticed during this trip is the double-message humans are sending to bears. There are various methods of baiting bears that we observed, all of which lead the bears closer to human interaction. Yet when a bear gets “too close” people shoot flares and cracker shots at it. If a bear is considered to be a nuisance, it’s darted and placed in Polar Bear Jail where it sits caged, in a metal and concrete building, until the ice freezes and it can be transported further from town. Sometimes bears are transferred from jail before the ice freezes, but as long as a bear is in jail we’ve removed it from its natural life cycle, rhythm and interactions with other bears. The alternative to bear jail is likely that the bears would be shot and killed. So while the jail is a more humane and preferred method of limiting unwelcome human-bear interactions, it’s our responsibility as people invading the bear’s habitat to minimize the number of bears that end up in jail each year. The more responsible we are with our human behavior, the less likely polar bears will engage in unwanted bear behavior. We watched the two bears, as the larger bear inspected the leg bone, the smaller bear that had been there first slowly walked away. The smaller bear instinctively knew it was no competition for the large bear and that it needed to move out of the way and let the large bear have the bone. As the bigger bear gnawed on the bone, the little bear maintained a substantial distance and stood submissively, head down. We continued driving the roads of Churchill and observing numerous bears. We saw bears crossing the road to get closer to the shore, conserving energy and resting, testing the strength of the ice and generally preparing for the imminent hunting season. It took longer for the ice to freeze last year so the bears got a late start. Luckily, the ice remained intact later into the Spring than usual, allowing some moms and new cubs additional hunting time upon emerging from their dens toward the end of the season. 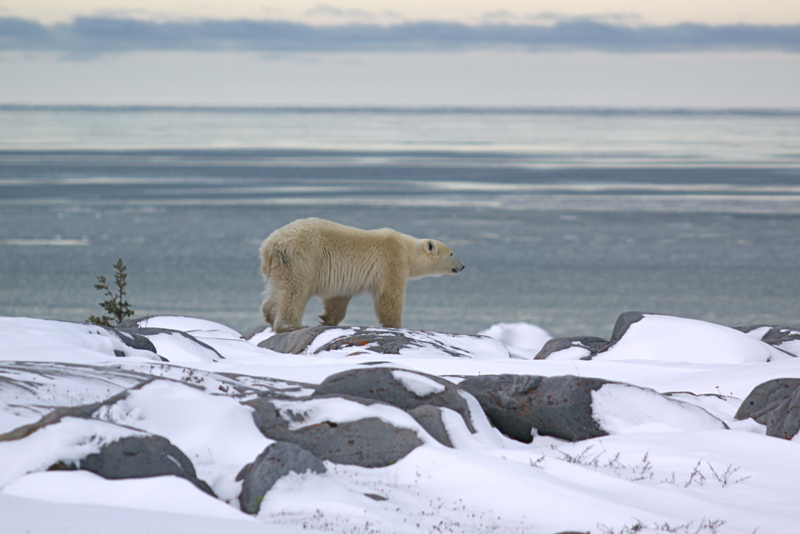 This additional time to hunt helped further sustain the adult polar bear population as well as that of the young cubs. We’ve seen a few skinny bears during this trip, but all in all, the bears seem to be in better shape and stronger than they were last year at the same time. We enjoyed a beautiful sunset before returning to the Studies Center for another informative evening lecture followed by the ritual late-night gathering in the kitchen. This entry was posted in Polar Bears and tagged Churchill, Climate Change, Polar Bears. Bookmark the permalink.